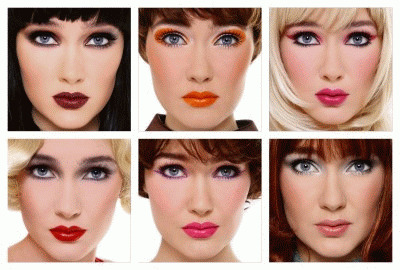 You will find many different makeup styles in the media and the world at large. Whether you’re going to a big party or the grocery store, there is a makeup style out there that is perfect for your lifestyle. Here is some information about popular styles to choose from so you can select the one that is best for you. Rather than transforming the way you look, the natural approach involves simple changes in the way your skin, eyes, and mouth look on their own. While natural makeup is great for everyday looks, sometimes it needs a little flirt and pizazz. Prom makeup has a tendency to be more elaborate than many other forms of makeup because prom is supposed to be a night where teens stand out from one another. The fancy dresses and up-do’s require some bold makeup to make everything flow well. Bridal makeup is usually pretty soft and natural to mimic the soft sophistication of the bride’s dress. While some brides will still go for bold looks with their eye makeup, most go for natural colors and then enhance them with fake eyelashes. Gothic makeup is one of the most extreme styles of makeup you could come across. This is usually full of dark eye shadows, eye liners, lipsticks, and more, all of which pair well with the dark clothing gothic people tend to wear. In the battle against aging, you can actually use the kind of makeup to wear to help you look and feel younger. Many makeup products out there actually contain chemicals that are meant to help older skin, and these products likely will reduce wrinkles and the appearance of them as a person wears that. Access to the hottest designers and stylists and constant exposure to cameras and papperazzi has made most celebrities place makeup high on their list of priorities. Airbrush makeup is any makeup that is applied with an airbrush rather than with the traditional tools that you might associate with makeup application. Instead of using your fingers, brushes, or sponges, you instead have a professional spray gun to give you more even, precise, and flawless coverage. Also known as cosmetic tattooing, permanent makeup has become hotter and hotter over the past few years. It used to be used as a technique mainly by models, actresses, or others in the entertainment business who wanted to shave lengthy hours sitting in the makeup chair. Although mineral makeup has been around since the 1970s, it has really taken off in popularity in the past few years.